Polski Drukarz Ltd. (founded in 1993) is the publisher of the monthly magazine “Świat DRUKU” (The World of Printing) and the organiser of “Akademia Wiedzy” (The Academy of Knowledge), that has been established to organise the conferences, with the task to stimulate information and experience exchange (www.akademia-wiedzy.eu). It is a member of: The Polish Chamber of Printing, The Polish Chamber of Packaging, The Polish Chamber of Flexography, The Polish Association of Screen & Digital Printing, The Polish Chamber of Promotional Products, the founder and sponsor of The Educational Foundation for Printing Staff and a partner of The Solid in Business Program. - Interviews, market reports, relations from important branch events, articles about organisation, management and labor law. “Świat DRUKU” (The Worlds of Printing) is also a media partner of some of the most important events in the industry. of the jubilee of our publisher – Polski Drukarz sp. z o.o. and the journal “Świat DRUKU” (The World of Printing). Over twenty years have already passed! Our publishing company was registered on 22nd of December, 1992 and the first number of “Świat DRUKU” (The World of Printing) appeared in March, 1993. The last twenty years have witnessed significant transformations and rapid scientific and technical progress in many spheres and, among others, in printing industry all over the world, including Poland. As every anniversary inclines us to reflection on our past, this publication includes an outline of the history on the development of Polish printing presented by the printing branch representatives and observers, some letters we have received from you as well as a number of photos from our archives. We would like to encourage you to subscribe our magazine. If you decide to buy the subscription, you need to write an email to prenumerata@swiatdruku.eu – in the return email you will get the detail information, what you need to do to receive it and be always well informed. Here you may find the list of our advertisement products with their prices for both printed and on-line versions of “Świat DRUKU” (“The World of Printing”) magazine. The technical information concerning the right preparation of the materials are also to find here. Here you may find the prices lists of our advertisement products on our Internet page www.swiatdruku.eu and in our newsletter. The technical information concerning the right preparation of the materials are also to find here. This is the next article published in the German printing magazine “Large Format” in cooperation with our publishing house. It is about the Polish fair RemaDays. It was published in the 3rd issue of “Large Format” 2016. Here you can read it in German (in PDF file). This is the next article published in the German printing magazine “Large Format”. 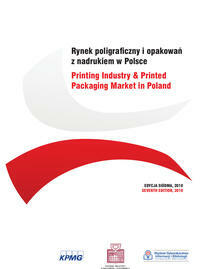 It is about the Polish fairs Poligrafia and Euro-Reklama 2013. It was published in the 7th issue of “Large Format”. Here you can read it in German (in PDF file). This article is the result of co-operation with German printing magazine, “Large Format”. It’s German version was published in the February issue of “Large Format”, Polish one – in the February issue of “Świat DRUKU”. Here you can read it in German (PDF file). English version can be found here. “Complex and iconic at the same time” – those were the words of the iF Design Award jury when praising the VariJET 106 digital press from Koenig & Bauer. They were especially convinced by the modern design language and clear colour contrasts. Accordingly, Koenig & Bauer was able to take home a “Gold Winner” trophy in the category “Product” after the grand award ceremony in Munich on 15th March. Avery Dennison is set to ‘wow’ customers at this year’s FESPA 2019 with a stunning new display booth filled with a range of their latest creations, featuring the Avery Dennison and Mactac brands. Drytac, an international manufacturer of self-adhesive materials for the print, label and industrial markets, is preparing to open a fully interactive training centre in Fishponds, Bristol: the Drytac Academy. Oedim assesses the business benefits of its investment in Fujifilm’s latest superwide format printer. Mastering screen printing doesn’t mean turning out perfect screen prints every time. It does mean knowing what to do when prints don’t turn out quite the way you want them to. One common problem to troubleshoot is an uneven ink edge. When something is off in your screen printing process, the edges of your ink might be blurred or wavy, or show the squared segments of your screen mesh. There are several elements to examine when your prints aren’t coming out with crisp, clear edges. Sustainable printing, where the consumption of printing ink and solvents can be reduced while maintaining or even improving quality, is no fiction: n-propanol, n-propyl acetate mixtures or pure n-propyl acetate (known as ‘Propyls’) can replace conventional ethanol, ethyl acetate mixtures or pure ethyl acetate (known as ‘Ethyls’) in flexible printing without any modification of existing press processes. While offering at least the same – and frequently even better – print quality, Propyls are on average 30% more economical in terms of solvent consumption while reducing ink usage by an average of 20%. Retardants such as Ethoxy propanol are not required for Propyls formulations. This offers considerable advantages when printing food product packaging. Improved process stability significantly reduces scrap percentages. Findings from industrial studies with Flexo and Rotogravure printers conducted worldwide by chemical company Oxea have been confirmed by a recent research paper compiled by the HdM University of Media Studies in Stuttgart. As the weather gets colder, the demand for sweaters heats up! Here’s a primer on the world of fleece. Fleece garments may be a mainstay for screen printers and garment decorators, but “fleece” can refer to a wide variety of fabrics. Here, we’re breaking down the different types of fleece fabric so you have a better idea of which fleeces are best suited to your projects. In late 2017, QuadTech was acquired by Baldwin Technology Company, a global manufacturer and supplier of process-automation equipment and related consumables for the printing, packaging and other industrial segments. In this Q&A, President of Baldwin Vision Systems, Karl Fritchen, answers questions around the acquisition, explains the positive impact this agreement will have on the industry and the company’s existing customers, and shares his vision for Baldwin Vision Systems moving forward. Screens are the lifeblood of a screen printing operation, so your profitability can depend on how well you maintain imaging performance while minimising cleaning time and material costs.